While gigapixel cameras are one of the hottest topics on IPVM, their dreadful frame rates have restricted them to niche use. Forget about one frame per second, those cameras are lucky to deliver a frame per minute. Now a startup is claiming 600 times faster frame rate with a completely different approach to gigapixel imaging. In this note, we dig into the technical details, pricing, performance and potential limitations. 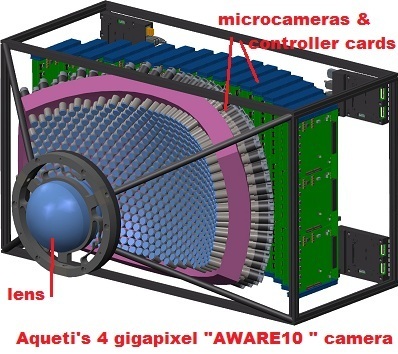 The AWARE gigapixel platform began as a Duke University research project. After several successes in field tests and a round of DARPA funding, the project has been spun off into a company named Aqueti. The 'first generation' of AWARE cameras have been deployed by the US Navy for maritime port surveillance, and the new company considers video surveillance to be a core application and development focus. This configuration allows for a very wide FoV - up to 120 degrees wide x 70 degrees tall - to be exposed by a camera with no moving parts and a single lens. Depending on the type of microcameras used, the same basic built type can be build a 1 gigapixel camera (AWARE2.0) up to a 4 gigapixel camera (AWARE10.0) with differences in central lens, microcamera resolution, and compiler card allowing a scaled architecture. Options for either monochromatic (black/while) or full color images are available. Size: The enclosure cabinet measures ~2.5' x 2.5' x 1.5', however much of that bulk are the attached compiler cards for the microcameras. If those hardware cards are installed apart from the camera, the footprint of the optics hardware would be less than half. Monochromatic now, Color later: The AWARE platform is currently built using B/W cameras, and the manufacturer cites this is due to limited testing and development resources during the startup phase. The manufacturer states that initial cameras were built to specific design criteria requiring B/W images. However, Aqueti can build current models using color image cameras and will offer standard color models with the next production release. Sample images reveals several types of visual flaws not apparent in other gigapixel offerings. Aqueti recognizes these flaws, and attributes many of them to the protypical nature of early models, many due to microcamera positioning, lens grind methods, and early versions of the stitching software. The company also gives direct feedback on how these problems have been resolved and fixed moving forward. That noted, users should carefully track the true resolving power of the camera. High Framerate: First, the maximum framerate from Aqueti cameras are up to 10 FPS. Unlike other cameras that generate 1 frame every 70 (or more seconds), the 4 gigapixel AWARE10 platform acquires images at near-surveillance real time rates. Solid State: Also, unlike other cameras that must repeatedly rotate to scan a wide FoV, Aqueti is built with no moving pieces to break or wear. The central lens allows for a broad exposure with no need to mechanically reposition the imager. Low f Number: Instead of a panning telephoto lens with a high f number, Aqueti's approach allows them to use a larger lens (f/2.0) that may improve low light performance. Proprietary Inefficient Compression: The current generation of camera uses proprietary encoding and compression that behaves much like MJPEG - a single frame is downloaded and then consecutively assembled together to create video. The developer suggests next generation of camera (with an expected release of Jan 2013) will include H.264 codecs that more efficiently manage compression and bandwidth. Extra Baggage: Because of the proprietary encoding method used, each AWARE camera must have a dedicated video server/storage directly attached to each camera. Not unlike the similar 'cameras per server' restriction that facility wide video surveillance carries, the 100 - 400 microcameras per gigapixel lens is limited by the same constraint. No VMS: No integration with 3rd party VMSes exists. The company says that as it finalizes 'front side' design, it will begin work on 3rd party integration. Not Weatherized: The camera has not yet been 'weatherproofed'. At the present time, AWARE platforms have been installed in controlled environments and have no field deployments in harsh climates. Aqueti suggests that the next phase of development will focus in this area. Early Production: Aqueti is still in 'startup mode' and is working to formalize its productions designs, internal business structure, and 'to-market' strategies. While the company has specific plans and timelines in place to develop these areas, it is a new company offering a new product - which in itself indicates some level of risk. Costly: While the price is high relative to megapixel cameras, it is in the same range as current gigapixel cameras with the crucial advantage of higher frame rates. For those looking for a wide area surveillance solution of high security areas, the pricing could be quite attractive. Integration Difficulty: The cameras will have to be monitored on a stand alone basis or additional time and cost will be needed for integration. The company aims to develop its own brand and sales, rather than OEM. They are looking for integration partners to build a channel. This is not an offering that will take over the mainstream in the months ahead but its fundamentally novel approach gives it an opportunity to become a major new force in wide area monitoring in the next five years. However, many risks and issues obviously remain. Aqueti has pivoted towards events capturing (basketball games, etc.) and is focusing on lower resolution cameras. Their current cameras do a maximum of 250MP at 6fps or 60MP at 24 to 30fps. Also, the output is raw and still not compressed for storage, etc.